A European spacecraft has snapped new images of our Milky Way galaxy, confirming the puzzling presence of a shroud of microwave fog around the galactic core. The new images come from the European Space Agency's Planck spacecraft, which showed the odd microwave haze during a survey that also turned up previously unseen patches of cold gas where new stars are forming. The energy haze was hinted at by a previous NASA mission, but the Planck measurements confirmed its existence, researchers said. The Planck findings should help scientists construct a more-detailed blueprint of the cosmos, they added. "The images reveal two exciting aspects of the galaxy in which we live," Planck mission scientist Krzysztof Gorski, of NASA's Jet Propulsion Laboratory and Poland's Warsaw University Observatory, said in a statement Monday (Feb. 13). "They show a haze around the center of the galaxy, and cold gas where we never saw it before." "We're puzzled though," Gorski said, "because this haze is brighter at shorter wavelengths than similar light emitted elsewhere in the galaxy." Several explanations have been proposed, including galactic winds, higher rates of supernova explosions and the annihilation of dark matter particles. This all-sky image shows the spatial distribution over the whole sky of the galactic haze at 30 and 44 GHz, extracted from the Planck observations. Image released February 13, 2012. One of the other newly released all-sky images from Planck is the first to map the distribution of carbon monoxide across the entire sky. Clouds of cold gas in the Milky Way and other galaxies are predominantly made of hydrogen molecules, which make the clouds difficult to see because they do not emit much radiation. Molecules of carbon monoxide are much rarer, but they form under similar conditions and emit more light. By scanning the sky for carbon monoxide, astronomers can then pinpoint the more elusive clouds of hydrogen where stars are born. Mapping carbon monoxide is a time-consuming process using radio telescopes on the ground, so previous studies focused on portions of the sky where clouds of molecules were known or expected to exist. But Planck is able to scan the whole sky, which makes traces of the gas detectable in places that have not been probed before, the researchers said. "The results achieved thus far by Planck on the galactic haze and on the carbon monoxide distribution provide us with a fresh view on some interesting processes taking place in our galaxy,” Jan Tauber, ESA’s project scientist for the Planck mission, said in a statement. 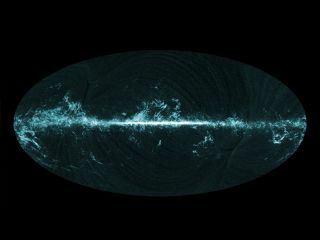 This all-sky image shows the distribution of carbon monoxide (CO), a molecule used by astronomers to trace molecular clouds across the sky, as seen by Planck (blue). A compilation of previous surveys (Dame et al. (2001)), which left large areas of the sky unobserved, is shown for comparison (red). The Planck observatory was launched in 2009 on a mission to take some of the most detailed measurements yet on the cosmic microwave background (CMB), a relic of the Big Bang that is believed to have created the universe. After 13.7 billion years, the CMB lingers in the cosmos as a pocked veil of radiation. By studying the CMB, scientists are hoping to understand what our universe is made of and the origin of its structure. But the radiation can be reached only after all the foreground emissions, which include the galactic haze and the carbon monoxide seen by Planck, have been identified and removed. "The lengthy and delicate task of foreground removal provides us with prime data sets that are shedding new light on hot topics in galactic and extragalactic astronomy alike," Tauber said. The new findings from the Planck mission are being presented this week at an international astronomy conference in Bologna, Italy. The first round of findings on the CMB radiation from the Planck mission are expected to be released in 2013.